Top notch acoustic male/female duo, primary songwriters and founders of Central Florida roots, rock reggae band, Souler Eclipse. 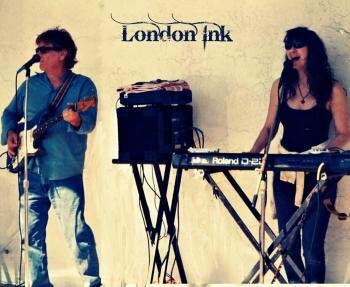 London Ink performs regularly on the finest ocean deck venues in and around Brevard and Volusia Counties and has performed at many resorts in Lake Buena Vista/Disney, Vero Beach and beyond. Experience in big stage showcases. Reggae/Island, pop rock and acoustic rock offerings done in artistic, original format by these statewide award-winning musicians/singers/songwriters. Stripped down acoustic selections and full sound backtracks, all performed, arranged and recorded by us, accompanied by precision live musicianship and vocals. Seasonal events now in session! Contact us for your festival, club, wedding or backyard party. We have booked some PRIVATE FUNCTIONS, but still have some open dates for local venues. Cheers to everybody!